For years (but not every year) I have been making costumes. It's been fun and now I still get to sew up new costume ideas. Sometimes, the best ones are the ones are the ones that come out of your head - not a pattern. 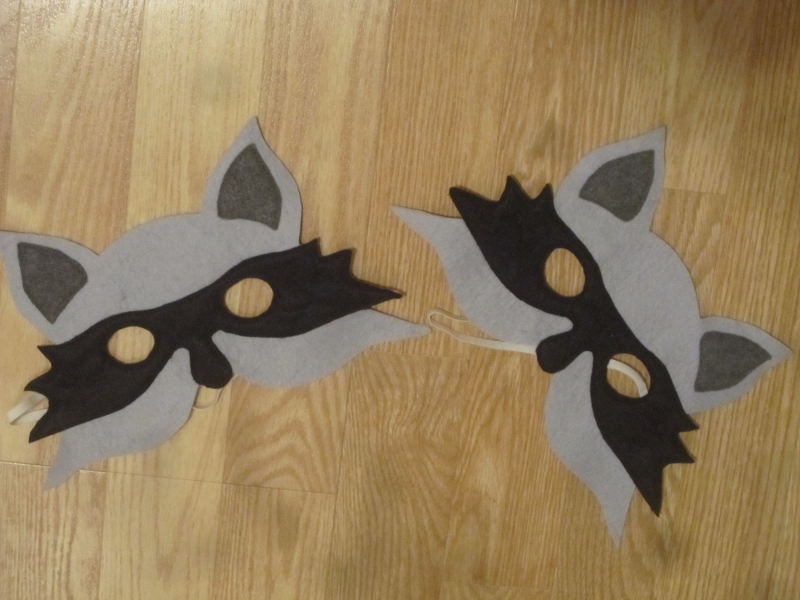 These are two raccoon masks that my daughter Maili wanted me to make. They will be dressing up as a family of raccoons. 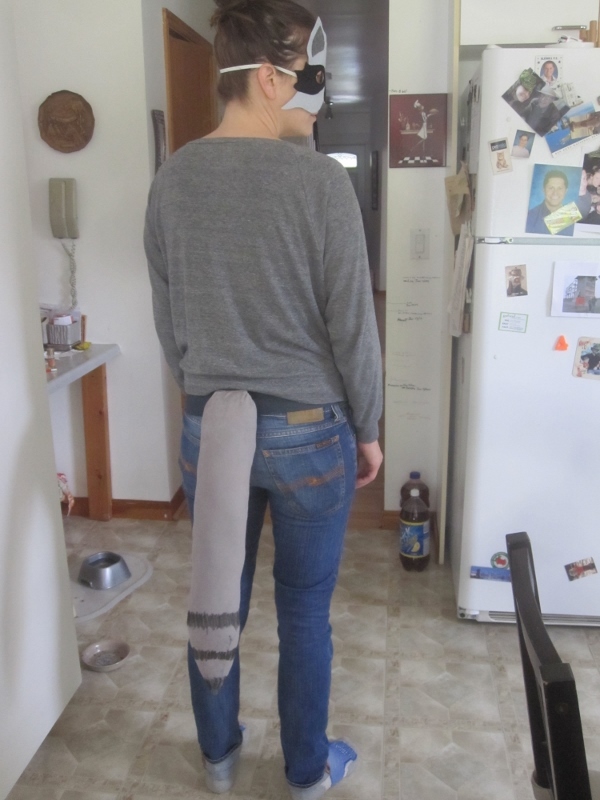 No mask for Teemu but I did make him a tail. Once I have a photo, I'll post it. These masks are felt and I sewed all around the edges of the appliques. 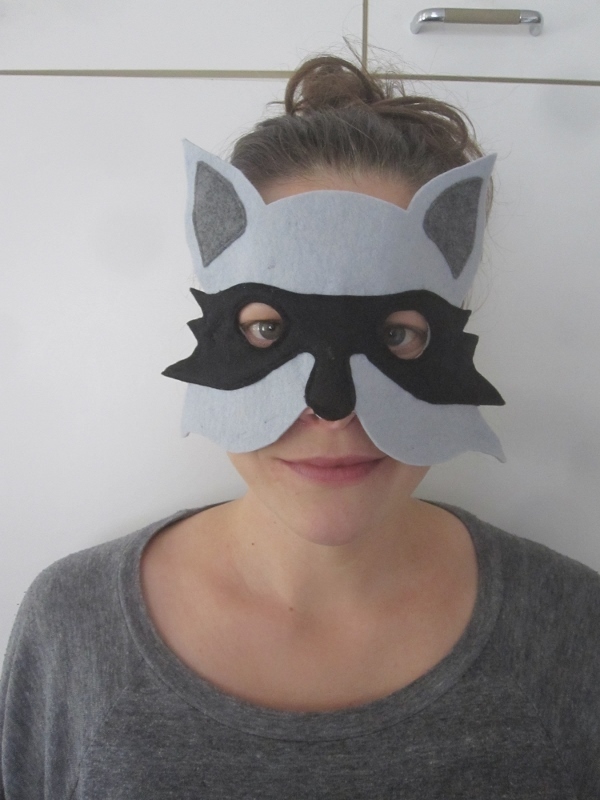 There is an iron-on heavy weight interfacing behind the whole mask to add body to the felt. The idea came from googling 'raccoon halloween masks." The thin white strip is the elastic. Here's Maili modelling the mask. I don't really use felt all that much so it was fortuitous that I had all of the colours I needed - just like the parrot costume I made for Patric. Here's the tail - partially coloured. I had that grayish knit fabric up on the shelf in my sewing room and I'm so glad I got to use it for something. I made 3 tails. Two adult ones and one for little Teemu. The stripes are just put on with permanent black marker. The tail is sewn on to a strip of felt that I cut to be used as a belt. I could have used velcro to close it but Maili said that she and Casey could just tie it in the front. Teemu's tail does have a velcro closure though, on the belt. 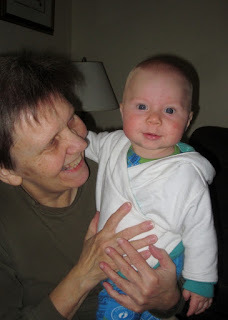 Here's the little dude - still wearing the hooded pullover jacket I made him when he was born. The pattern stated 0-3 months but obviously it fits up to 5-6 months. I'm hoping to have photos of the big people and the little people in their costumes later today. The mask looks great on Malli: it covers a good part of the face. Nice job. You did a great job of those masks. Happy Halloween! Fun costumes - I love the raccoon masks! Little Teemu looks so cute! And you, Dolores, look very proud and happy.